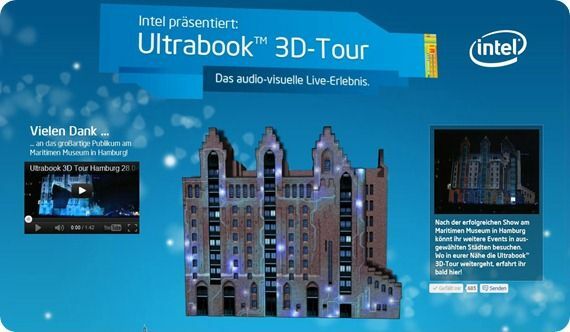 If you’re in Germany you’ll need to hook up with the Intel Germany Facebook page to find out when the event is going to pop-up next. As we’re located in Bonn we’ll be looking out for information on the Koeln session. Let us know if you’re going to be there. A Koelsch goes well with an Ultrabook chat session! Dresden, Duesseldorf, Berlin, Suttgart, Muenchen and Koeln are on the cards. We’ll add the dates below when we find out. In the meantime, German readers might want to check out the ‘Traumreise’ competition. Mitmachen und Gewinnen! The full show taken with Nikon D800 + 14-24 and Rode Stereo Mic Pro. If you’re planning to go to Koeln to see the Ultrabook truck and show, drop your name here. I’ll try to arrange a meet-up. « First Hands-On With the Sony Vaio Ultrabooks Surface. Ivy Bridge Confirmed.